Being kind to yourself changes your brain and increases emotional resilience. Being kind to others changes the world. Anna is a registered health psychologist based in Auckland, New Zealand, working clinically with private clients. She is also a certified teacher of mindful self-compassion with a deep personal commitment to these practices as pathways to reducing stress and increasing emotional resilience and well-being. Learning to be mindful and to treat oneself with kindness when meeting life's inevitable challenges is a powerful antidote to depression, anxiety and burn-out, enabling one to live with ease, connection and contentment. Evidence shows mindfulness and compassion practices are balms for many modern day ailments and can increase resilience and wellbeing. Anna is a regular speaker to both corporate and community audiences, sharing personal, professional and academic expertise. Life can be difficult. Learning new tools to cope with emotional and physical distress can help. 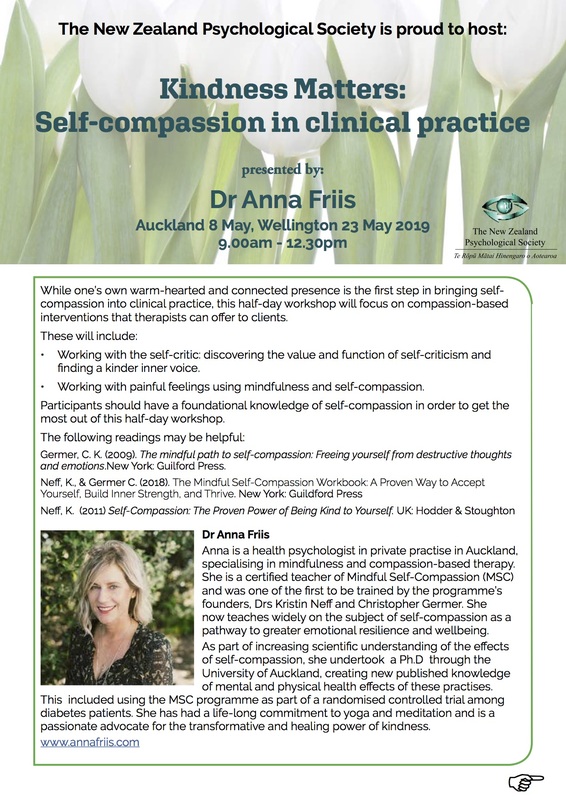 If you feel that compassion based therapy may be right for you, contact Dr Anna Friis for an appointment (clinics in Remuera and Grey Lynn). Kindness Matters: An introduction to the science and practise of self-compassion. Some introductory knowledge is a pre-requisite to Workshop 2. "While it was a bit daunting signing up for a retreat, what I experienced was a weekend surrounded by some amazing, funny, brave people and led by two simply beautiful human beings. Anna’s wisdom and expert guidance are a sight to behold. And the very grace-full and graceful Megan was a perfect complement to Anna. You get to choose how you want the weekend to be for you and there is no pressure to do anything you don’t want to"
"I just want to express a huge thank you for the course you ran at Waihi and how it affected so many lives. You and Megan are so very inspiring. I have been on retreats before but this one was actually transformational. Many thanks from my heart"
"I’d like to wholeheartedly thank you and Megan for the wonderful experience of the mindfulness and self-compassion weekend retreat. My heart and mind have been full of warmth with more clarity throughout the week and when my thoughts have wandered I’ve had the awareness to channel them back to kinder ground. What a tremendous gift you and Megan have shared with us all! Thank you"
"Wonderful synergy between Anna and Megan - delivered individually and together – resulted in an intimate weekend of guidance and self-reflection. It was sometimes uncomfortable, but always safe. First steps in finding that space that allows you to be more self-accepting and permission to be kind to ourselves. Warm and gentle teaching interspersed with meditation and reflection, gentle yoga and absolutely scrumptious food – wonderful"
"Thank you so much for the lovely weekend of mindfulness and self compassion. It was just what I needed to get me on my journey of healing. I am very interested in doing the Deeper Dive next year"
"Many thanks Anna and Megan. I also would like to thank everyone else on the course who made it such a special amazing experience and I wish you all well with your practice. It is day 4, now, and while I have found very few moments to meditate specifically, I am catching myself more times during the day and stopping and breathing"
"Truly magical. So blessed to be a part of this weekend with such gorgeous people"
"A special thankyou to you Anna and Megan. Words cannot convey the magic you both weaved over the weekend . The whole retreat was filled with both of your love and compassion . From your skills to the scrumptious food you gave us, the whole weekend was wonderful. Some of our group’s closing words to describe our retreat were "nourished , calmer, mindful, gratitude acceptance, privileged to experience it” Thank you also to the wonderful group of people who shared this experience"
"It was a truly wonderful weekend. I learnt a lot and it’s an opportunity I’m really glad I took up. Very grateful for the experience"
"WOW, what a special weekend, am virtually lost for words but filled with love and happiness! I loved and savoured every delicious moment and can't wait for "Deeper Dive" next June. There is so much I learned and am using already. You and Megan are amazing"
Ultimately, self-compassion is a courageous attitude that stands up to harm, including the harm that we inflict on ourselves through self-criticism, self-denial, or self-absorption. Anna is an experienced teacher of self-compassion, drawing on many years of personal and professional practise.